Poly(ADP-ribose) synthetase inhibitor, INO-1001, is known to sensitize cells to radiation in vitro by inhibiting the repair of DNA damage. Recent evidence has suggested that PARP inhibition may also be a way of selectively targeting p53 deficient cancer cells. The present study tested INO-1001 for its in vivo effect on the chemoresponse of two p53 deficient tumors, human breast cancer MDA-MB-231 and murine mammary carcinoma MCa-K. Doxorubicin was used as the DNA damaging agent and tumor growth delay assay was used as the endpoint. 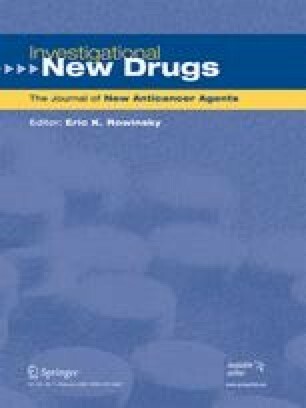 Results showed that INO-1001 was highly effective in enhancing the anti-tumor effects of Doxorubicin for both MDA-MB-231 (EF = 1.88) and MCa-K (EF = 1.64). We conclude that PARP inhibitor INO-1001 has high potential for enhancing the anti-tumor effects of chemotherapy agents such as Doxorubicin against p53 deficient breast cancer. Sponsored by a Laboratory Study Agreement with Inotek Pharmaceuticals Corp and NIH Grants CA06294 and CA16672.